The new playground features custom playscape structures designed by New School alumnus Josh Hart’s company Natural State Treehouses. The new “naturescape” playgrounds and outdoor classrooms feature boulders, mounds, sand, trees, shrubs, and gardens. 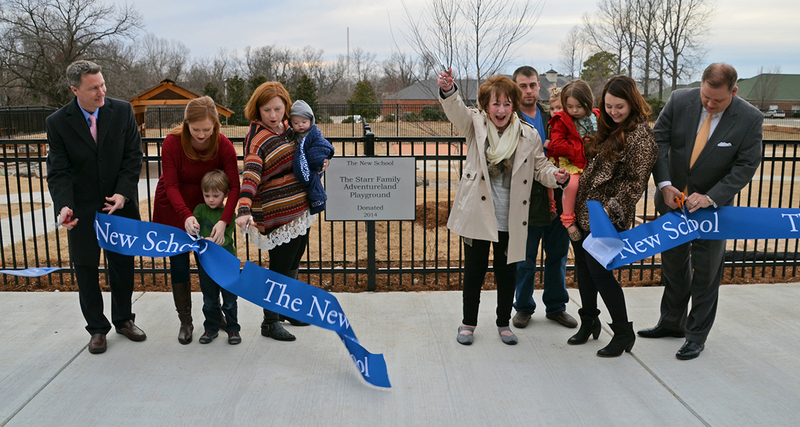 The new space includes a preschool outdoor classroom, a toddler outdoor classroom, a toddler playground and two preschool playgrounds, offering students an opportunity to play and learn in a natural setting. The playground features open-ended spaces that encourage children to use their imagination, curiosity and creativity while they connect with nature. The playground features and equipment include wooden playhouses, bridges, bike paths, wooden planters for gardens and a dry creek bed. In addition, a climber will be installed on the north playground in the next few weeks and outdoor classroom areas will be used for more teacher-directed activities such as outdoor art, gardening, and science activities. Special thanks to The New School Board of Trustees, the chair of facilities committee Bob Kohler, Head of Preschool Karen Beaton, Allison Architects, Inc., Flintco, LLC., civil engineer Blake Jorgensen, landscape architect Melissa Evans and owners representative Jim Foster.